Suite 2705-1111 Alberni St, Shangri-la Vancouver. It was a nice NE corner unit, 1094 sq.ft. 2 bedrooms, 2 bathrooms, and a small den with some city views, and a corridor water view. The unit was in original condition, but very well kept as it had been owner occupied for most of its life. It was listed at $1,510,000 on September 19th 2017, and sold in 8 days for $1,490,000 ($1361.97/sq.ft.). We showed it to about 15 groups within the week. We had one offer within 6 days, which was slightly too low for the seller to accept, and after declining that initial offer, we then received a better offer the next day which after some negotiation landed within 1.3% of the asking price. 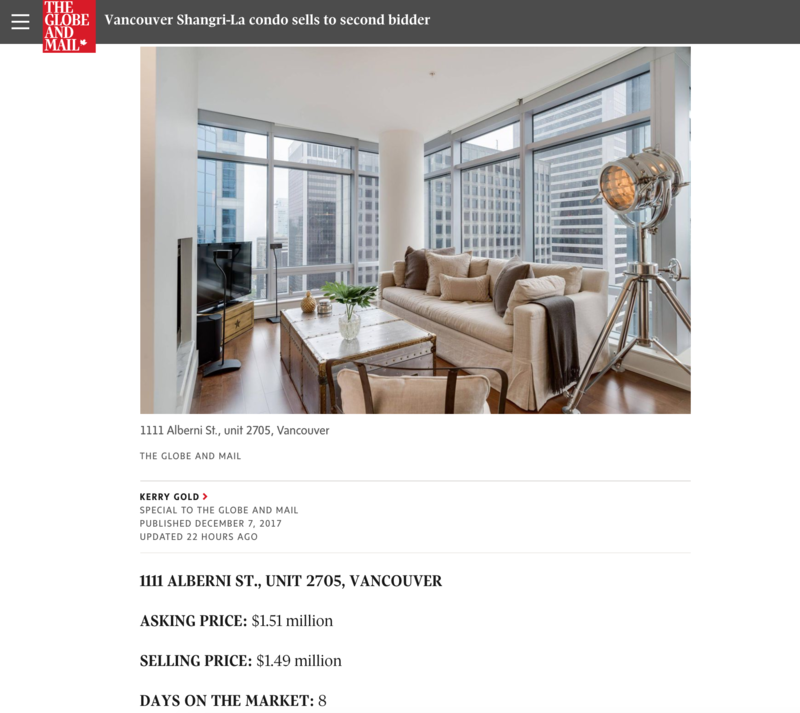 We have sold 5 condos at Shangri-la Vancouver, and have a dedicated website for this building, www.shangri-la-condos.ca which is also in Chinese. 50% of our visitors are from out of country, we have met many buyers and international clients through this website.